« Gullible leaders, journalists, swallow advertising and cheer it on? The North Korean disaster led to the estimated death of between 220,000 and 2,000,000 people, 1% to 10% of the population. The famine, which continues to this day, has led to food rationing, black markets and a government keen to get foreign currency by any means — including drug smuggling and nuclear technology sales. The disaster has led to a decarbonizing of the economy, which can be seen from the estimates of carbon dioxide emissions from fossil fuels shown in Figure 2.
figure 2: Estimated fossil fuel emissions of CO2 for North and South Korea, per capita (left) and total (right) (source CDIAC). North Korean per capita CO2 emissions fell by more than two thirds from 1990 to 2000. North Korea does not use natural gas but is self sufficient in electricity supply, being half hydro and half coal fired power stations. On the other hand South Korea depends largely on imports including natural gas. Figure 3: Estimated fossil fuel emissions of CO2 by source, for South Korea (left) and North Korea (right) (source CDIAC). In 2008 electricity use was 8,800 kWh per head in South Korea, and 819 kWh per head in North Korea where the power supply might be limited to 2 to 4 hours per day. North Korea is a tragic example of the failure of central planning. It reduced its economy to a third world level, while surrounded by some of the most vibrant economies on the planet. The consumption of electricity in India is fast growing, and has now passed North Korea. The “central planning” of the EU worries German business leaders, as they see cheaper power in North America. The UK is considering managed power outages in the coming winter. In Australia, with a population almost the same as North Korea (24 million), we handicap our mineral processing with high energy costs. Living on mushrooms … no doubt? This is what the West will look like if the commies …. er…eco-loons get their way. North Korea looks to be an excellent place for amateur astronomers who are constantly on the look out for pristine, non-light polluted skies. Is that why North Korean astronomy leads the world? Alas for amateur astronomers possessing a telescope or binoculars would brand you as a spy in the DPRK. Tourists are not permitted to bring binoculars or telescopes across the border and none are available for civilians to buy. Sadly, we need electicity to turn the big telescopes. Oops re typo. Electricity. Cheers, all. No elections , no electicities either. National CO2 emissions generally run in a pretty good lock step with stats like infant mortality and % of population with a high school education etc. Basically every measure of human welfare will be tracking emissions levels. In the adult world we refer to it as “industrial development”. NK’s example would no doubt be regarded by greens as a win, win, win. Less emissions, less people, more suffering, more ignorance, its like a green utopia. All they need is bears and great cats to get their populations back up to a level where they can regularly threaten and kill citizens and greens can hold it up as a model for the entire planet. If UK and USA play their cards right, they could be enjoying the same conditions by…. say…. um… 2030? We are carbon based life forms on a carbon planet. What can you expect, honestly? When it comes to North Korea, it becomes even more astounding when you go back to the year 2000. Currently, North Korea generates a total of 18TWH a year, so with a population similar to that of Australia, they only have 8.8% of the total power generation that we have here in Australia. The mix of generation is only from 2 sources, Hydro 12TWH and coal fired power 6TWH. No wind and no Solar. However, go back to the year 2000 and the total generation was 30TWH. All of that drop has been in the coal fired sector. Now, while this Post is about North Korea, I know it’s not really polite of me to add a comparison with Africa, but North Korea still generates more power than 32 Countries in Africa with a total population of 260 Million people, so while North Korea is going backward, they are still far and away ahead of what Africa has to put up with. 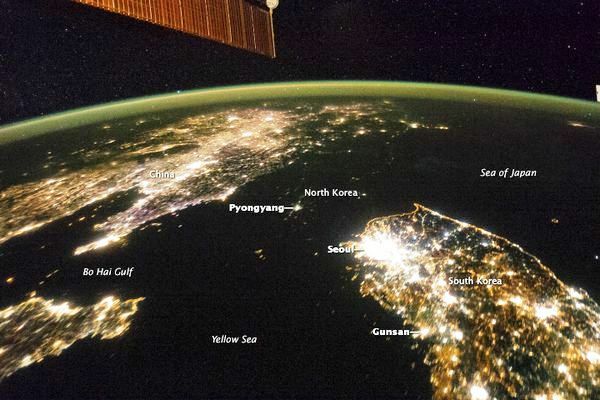 While looking at the image of North Korea by night is pretty stark, have a look at the image at this link of Africa at night. Note that where there is some visible light areas, those ones in the North West were all once Colonies of European Countries, and the other two are Egypt, and South Africa. All the rest are still virtually in the dark. Compare Africa with Europe, the UK, and even Scandinavia, all to the North of Africa. Hey Tony. You’re good at crunching power generation numbers. Any chance you could let us know how many wind turbines it would take (and the area they would cover) to bring N Korea power generation to the same level as Oz? it’s a pretty pointless exercise really, because no matter how many you construct, you still only get power at a Capacity Factor of 30%, or a bit over 7 hours a day. But, hey, just to show you how ridiculous it would be, it means 28,595 towers with 2.5MW nacelles on top. That gives a total Nameplate of 72,000MW, and a total power generation of the 188TWH to bring it up to the same total generation here in Oz. A typical monster scale Wind Plant is around 500MW, (200 towers) then that’s 144 of those Wind Plants at an average of $2.2 Billion per plant, so $316 Billion. So, the largest Wind Plant in Oz is Macarthur, which covers 55 Square Kilometres, so that makes each proposed NK wind plant covering 65.5 SqKm, so 144 of them, that’s 9,430 SqKm or 7.9% of the total land mass of North Korea. And still only power for a tick over 7 hours a day. Post Script – Hey, is that enough number crunching on my trusty old Casio fx-100C. Right about now, I can just imagine that most of you are chuckling to yourselves, but there is a serious aspect to this. This exercise I just did is the actual intent of the UNFCCC, which as part of it’s protocols, has set in stone that the already Developed Countries of the World must pay for this, and only this form of power generation for all Countries which are still developing. And that’s no conspiracy theory. It’s actual fact. See my Post at this link, quoting wording directly from the UNFCCC. I suspect there is a word in my moderated post which has been picked up by the auto moderator. You’ll know the word, cons*****cy. I guess I’m still compiling my list of auto moderated words, so sorry about that. I got moderated for the word ‘prostitute’, which proves there’s a lot of pros and cons in moderation. I have 2 in moderation at the moment. That was for TonyfromOz but I think the matrix jumped? Please, no Konspiracy Theories about moderation here. Tony. Don’t disrupt your Casio’s activities for this, but if you ever come across the percentage of each of solar and wind generating units constructed in the last say 5 years which are still in serviceable condition, please publish the information. If the ten year figure was available that would be much bigger. I suspect that a lot are not. And while the government subsidises the installation, who funds the warranties? And who cleans up the defunct ones ??? I seem to recall that back about the year 2000 an ABB GT-26 in the form of a KA-26 combined cycle power station went to Pyonyang. That’s about 400 MW. It might be part of the drop in output between then and now, if Kim I Am lacks the fuel or the O&M skills. Is my memory playing tricks? Having been to both places I can assure you that Africa in winter without electricity is much more agreeable than the DPRK! (Reuters) – North Korea has registered eight hydroelectric plants with the United Nations, and if approved, could allow the world’s most reclusive state to sell carbon offsets to earn precious hard currency. These hydropower projects were registered with the United Nations Framework Convention on Climate Change (UNFCCC) for prior consideration in getting carbon credits, some of which have a capacity of 20 megawatts, the UNFCCC website showed. Prior consideration is the first step for accreditation toward the U.N.’s Clean Development Mechanism that allows developing countries to earn tradeable carbon credits for emissions from clean-energy projects. An excruciatingly repressive failed nation state benefits from UN largesse? I suspect that North Korea is the UN’s ideal for the rest of us. Even more bizarre as technically the UN is still at war with NK – that little police action in 1950-53 ended in an armistice, ie a cease fire, not a peace treaty. Read it here in the New York Times (June 1986). I have two high quality temp gauges at my house in Brisbane. One is in the shade at the back of the house and one is on a brick wall at the front partially in the sun. A lead news item on ch 10 last evening had the news reader telling us wide eyed and breathlessly that temp records could be broken for November with a 41 degree scorcher. It is 1.25pm and just made 30 at the back and 34.8 at the front. It will only drop from here. We are are hosting the big global warming show this weekend. I’ll bet the rest of the world will only get the alarmist forecast and not the factual data. I swear Sydney CBD was in the mid 20s at 1pm on Fri, contrary to “official” mid 30s. I have zero tolerance of heat but felt no wave walking outside from A/C building. My strong suspicion is that a “data error” is found after G20 disbands. Well it was damn hot in Brisbane. I’m on the outskirts on acreage so no urban heat. At 12.30 the temperature in the shade on my back deck was 42 degrees. Strong breeze blowing but it was warm too. I am old enough to remember similar temperatures in the past so global warming/climate change had nothing to do with it. Greens regularly claim we need a “new” kind of economy, a non consumerist economy, though they are usually very, very careful not to clearly define what they mean. David Cameron, the allegedly Conservative prime minster of Britain, regularly suggests he wants to replace GDP as a measure of economic progress, with a measure of “happiness”. Obama once promised to make “electricity rates skyrocket”. One question – are they crazy, stupid, or both? Neither. They are liars and evil. PeterS. Thanks, short and to the point. The leftists and greens, and that is mostly redundant to list them both, would like to see much of the world like North Korea but with a few islands of prosperity and luxury located in the most beautiful and pleasant resort areas in the world. Of course, the Elite (the leftists) would live in these lap of luxury areas) and use their military forces to keep the rest of the world population in hopeless poverty and servitude. It is no mistake that these evil people are gaining power and influence in many areas of the world. This is a religious war – make no mistake. Religious war – how so? I can think of so many examples of the Elite of this planet being involved in the Occult ( dark arts ) it isnt funny. As such, anyone who isnt on “their side” and not trying to think of ways to enslave people through energy rationing and “benevolent” death by freezing the vulnerable in their own homes – is considered “uneducated” or “un-Illuminated”. This type of evil doesnt happen by accident, its deliberate, calculated and genocidal. The same demonic spirit that was behind Nazism is behind these people. We know of his as Satan or the Devil. I would also like to make this additional point – not all of the elite are bad, I am sure many are good. Please dont assume that “elite = evil”. We do we need a system that radically reduces government involvement in it. But I don’t believe that is what the ‘green scum’ want. They are in a state of flux, burdened by the democratic cycle, but now we have the Third Way. I propose a student exchange program with North Korea for those enlightened progressive students that really want to make a difference with other peoples money by experiencing first hand centralized government and brutal sustainability. After 1 year it’ll be interesting to see which students want to stay in their host country, I’ll make a very obvious prediction now….. I suggest we send the Greens over their permanently. I would happily offer to pay a business class fare to dump people such as Milne & Bandt et al in the middle of places like Nth Korea and Africa and even places like the agricultural areas in India, China & Indonesia…and let them fend for themselves for a minimum of one growing season. I would then dare them to come back to Australia and tell us why they’re so convinced we’re doing it all wrong! No challenge here. The exchange students to N. Korea will all want to come home, for obvious reasons. The exchange students from N. Korea will all want to stay, because they will all be hand-picked intelligence agents and those will be their orders. I understand the North Korean famine from 1994 to 1998, and you can see the dramatic plunge in power usage, in the graphs. But what caused the apparently parallel dip in South Korea’s power usage? To all intents and purposes, they are separate countries. I guess belligerent North Korea didn't have so many friends and that's what's kept it in the DPRK ever since. 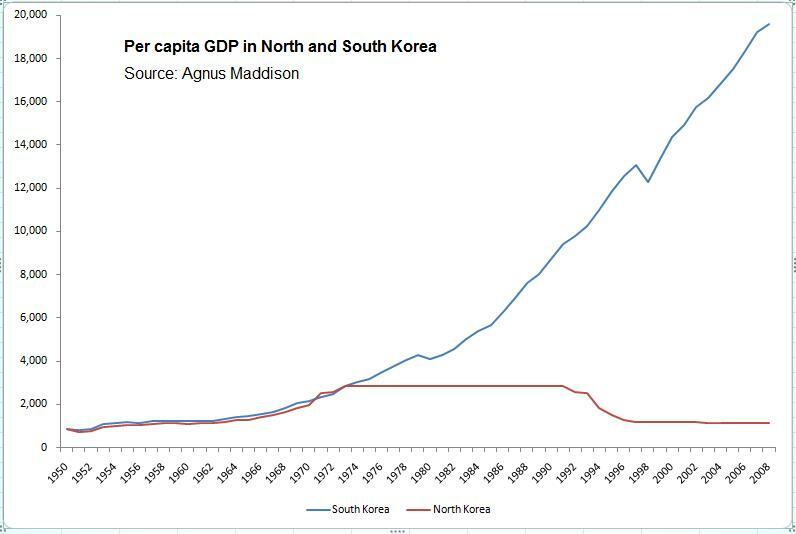 That small surge around 1971 too is when North Korea was thriving with a GDP comparable to S Korea. Note the GDP per capita in Red, till it fell back to 1959s levels in the early 90s. Doesn’t the almost complete recovery of S Korea and other Asian economies within just a very few yeàrs of the 1997 crisis vs. the terminal demise that seems to have triggered in N. Korea , make you wonder who is living in the real world ? plus others too numerous to mention, but you get the picture. Plant life would be suffering in North Korea. What a tragedy for the people of North Korea. How awful is the fact there are so many “progressives” who would like to consign us to the same fate! You know how it is with that sort, they are utter failures at understanding history. Pol Pot comes to mind. “You know how it is with that sort, they are utter failures”. There I fixed it again. Robert was being far too generous. NK plant life is fine… they have the biggest emitters of CO2 right next door. All that free plant food drifting across the border. Well the alarmists are always that we need to get rid of democracy to be able to bring down our emissions. I guess they are right. Cambodia – Total power generation 980GWH for a population of 15.3 Million people, with nearly all of that power generation from Fossil fuels. No Wind or Solar. That’s the same power consumed here in Australia by Dubbo and Tamworth, with a population of 80,000 people in total. “Khmer Verte”, I like that meme – suggestive, virulent, impossible to quash. Or even a Khmer Pastèque for that matter, to acknowledge their true colours, though I admit that sharp ‘V’ and a well rolled ‘r’ give Khmer Verte more of an edge. so does Merrill Lynch bank. Bob Carr wants an E.T.S. The conflicts of interest foolscap pages long. This may be off topic , but on todays ABC Insiders Barry Cassidy asks Joe Hockey ..’does he accept that climate change is potentially a impediment to economic growth’? Now I concede that I may not be to bright but the question confounds and confuses me considering the costs of implementing climate change policy and after looking at the above article. Any thoughts?..Anyone? What was Hockey’s answer, Trader ? Did he set them straight or humour their self indulgence ? As proven in Spain, and many other parts of the EU, it is the RESPONSE to the climate change/evil-CO2/scam that really puts economies at risk. So much money has been basically flushed down the loo. It really has been stupidity to the max. !! Hockey’s on 2GB right now. Resuming right after the News. Cambodia under Pol Pot was another green utopia. Green perhaps but Utopia, I think not. Read Cambodia year zero by Francois Ponchaud. I lived in Thailand for 10 years and stayed near the cambodian border for some time at a friend’s house. And his brother was a border policeman at the border crossing near the village that pol pot was living in. Living very quietly I might add. When the sun rose one morning Pol Pot didn’t……. North Korean Spiced Pine-Bark pulpcake. If bark is still on wood, take wood to rats and beetles, and beat hard against rats and beetles until both are reduced to a fine pulp. Eat pulp-cake. If bark supplied separate from wood, beat supplier to pulp, eat pulp-cake. Who said you can have spice. How did you know about spice? Beloved Leader says all spice-lovers are running capitalist-dogs and must be shot. Report to re-education police unit for your lead injection. This is a rough translation from the original that was found on a half-eaten paper sandwich that blew over the Korean border. I’m sure the Labor socialist left and the Greens would love us to live like the Nth Koreans. That’s us not them of course. Luxury living for them but totalitarianism and poverty for the rest of us. O/T but here is good punchy post by Eschenbach about Trenberth’s lack of understandind about SLR. How stupid are these people? Renweable Energy Never Hurt Anyone… Important! “Renweable Energy”: What you get out of two 1.5V torch batteries, just before the light goes out. The failed climate talks all aim at getting global emissions back to the 1990 level. Per capita that is about 0.7 tonnes of carbon, similar to North Korea’s level of emissions. Australia and USA at around 4-5 tonnes per capita, so need to reduce emissions by 80-90%. That’s a brilliant post Jo and Tim. More of an illusion really and democracy works more by accident than by design, yet it works. Not so much knowing what’s right as the people recognising when the leadership has gone wrong. It’s just a pity it takes them so long to realise and do something about it, time after time..
Democracy’s saving grace is in its ability to evict the incumbents from time to time. Democracy is inherently unstable as it panders to the lowest denominator. For some reason most of us think that this is the best system that humanity invented. Looking at history from ancient Greece, pre-Caesar Rome or 18th century France all these periods were sporadic and invariably fell. Do we really think that we live In better times and somehow we will continue with democracy far into the future? I doubt it. Democracy requires economic freedom, which we don,t have anymore. Requires robust open discussion that is muzzled by one sided media. Journalism and science once a mainstay of respectability now complete a disgrace. Average person too busy and not interested. The rot of democracies is never more obvious than in the US now. Huge debt, loss of classic American individual thinking. If they are lost what chance do we have? I see my son dying on barricades of democracy, possibly after my death. If that happens then I will know (even in my grave) that I have failed not only as a father but more importantly as a human being. With North Korea we all have failed. Suffering and death happens now. Just like in the Ukraine during the 1920-ties when 8 million people died of starvation and yet hardly anyone knows about it. The intellectual red of the west, today,s watermelons with black seeds of fascism were equally enthralled by great uncle Joseph Stalin Often going there never to return (killed). Same fascination continued with Cuba and now somehow North Korea is in the running. I’ve believed from the start that all the North Korean nuclear missile rattling is an attempt to get the west and the U.S. in particular to send massive infusions of money to rescue Pyongyang from a very unhappy populace, lest the people rise up and overthrow comrade Un. Apparently George Bush saw through all the bluster too because he steadfastly refused to even go to the negotiating table. … to rescue Pyongyang from a very unhappy populace, lest the people rise up and overthrow comrade Un. I am no expert on North Korea, but everything I read indicates that there is little chance of the populace rising up to overthrow the government. There was a window, where Kim Jong Un was exposed, until he took decisive steps to “remove” all those who could challenge his authority, and then heavily rewarded the generals who stood with him in that process. While the army is loyal, he will remain in power. If you look for them, there are lots of parallels with Rome circa 30 BC, both politically, and in the way the populus survives. OT The Arctic Sunrise has been making a nuisance if itself in the Canaries. What do they expect with a name like Greenpeaces pain ? Spain has fallen for all that renewables stuff once already. Greenpeaces currency is over. democracy works more by accident than by design, yet it works. Democracy works only as long as those voting understand that there is no such thing as a free lunch and who are individually willing to pay for what they eat. A lunch taken from another by force (taxes et.al) is not only not free but costs the thing that makes making that lunch possible: freedom. THAT is the most costly lunch of all. There is no substantive difference between a totalitarian dictator backed up by a gang of thugs called an army and a population voting with the presumption that the majority can successfully decide what is right, true, and workable for all matters. They both presume that decision is the important thing, that really knowing something is irrelevant to successful action, and that all one needs to do is initiate enough brute force to make whatever it is they want possible and deliverable. Yet, reality is what it is and brute force is what it is. Together the result is a North Korea or worse. Have respect for individual rights, prohibit initiation of force of one upon another, and leave the individual free to pursue his own best interest, the end result is the United States or better. There is a direct cause and effect relationship that cannot long be ignored. So called “pure democracies” can exist until the store of previously created wealth and the willing victims of human sacrifice have been consumed. At that point, the means to create a future is gone and the society collapses. Sadly, mankind has repeatedly demonstrated the truth of this. Yet it has refused to learn from that demonstration for more than a few precious generations at a time. The bottom line is that ideas do matter. The right ideas lead to success. The wrong ideas lead to failure. Wishing, hoping, and chanting “Yes we can!” has no positive effect beyond a momentary feeling of euphoria. The basic truth is that brute force can only achieve death and destruction. It cannot achieve life nor create those values necessary for sustaining and advancing the quality of life. If you think otherwise, take a long careful look at the history of mankind. The evidence is there plainly written in mountains of dead bodies, rivers of blood, destroyed civilizations, and widespread pain, suffering, and poverty. All interspersed with the discovery of how to use the human mind, advances in knowledge and technology, and a few all too brief periods of respect for the individual and his inalienable rights as a natural part of his nature. I sometimes think of what might have been if there had not been a very close to hot, Cold War with Stalin’s USSR and there had not been a “Korean Police Action” ie Korean War by the UN forces in Korea when North Korea with russiann urging, it was going to be a pushover and nearly was, invaded south of the 38th parallel and Stalin tricked Mao Zedong and his generals, there was not a good relationship there between Stalin and Mao Zedong at all, into getting very deeply involved while the Russkies stood well back except to use that war as a analysis of American and UN’s resolve and fighting capabilities. Without the cold war and had the Western powers had good relations with the Russians, most of the Marshall Aid used to rebuild Germany as a bulwark against a predatory Stalinist USSR would probably have gone to Russia to rebuild and Germany would have been left to rot for a couple of decades after the other Europeans had to fight them twice in only 30 years just to survive the German’s long standing obsession with themselves, the Aryans becoming the Master Race of the world. Much the same or perhaps even harsher judgement would have dealt out to Japan if the Cold War plus the Chinese communists rise to power in 1948 had not occurred. Japan would have been left as a thoroughly de-industrialised nation for two or three decades after the viciousness of their actions in China, SE Asia and against anybody they came up against, particularly after their sneak attack on Pearl Harbor although the Japanese foreign affairs officials in New York tried to tell Roosevelt’s minions that they were officially declaring war a couple of hours before the Pearl Harbor attack but failed to carry through with the communique. Like Germany, Japan had immense American resources ploughed into it over a few short years post WW2 so it could act as both an Asian democratic bulwark against Chinese and Russian expansion in the East Asian region and as a secure American base close to the Chinese and the USSR’s Far East armies. We certainly would be living in a different world today if there hadn’t been a Cold War and a communist take over of China but what it would look like I couldn’t even guess. It’s history what happened and can never be changed although it can be, has been, will be rewritten any number of times by various players with agenda’s for long into the future. And North Korea would not exist. It would just be Korea , a very powerful and American rebuilt, heavily industrialised Korea which would have probably quite gleefully wiped Japan from map economically and politically for it’s semi slave labor and grossly exploitive occupation by Japan from 1910 to the end of WW2 in 1945. A so called consumer society cannot exist without there also being a producer society. A value not produced cannot be consumed. Hence, production must always proceed consumption and is therefore the higher value. If you destroy or make impossible production, you have also destroyed and made impossible consumption. That is except for the production that occurred and not consumed in the past. See the 18 trillion federal government debt for a case in point of consuming accumulated wealth. The debt was doubled, production was restricted, wealth was destroyed by taking on the debt. It will take generations of production to pay it off if it ever can be paid off. Again, there is no such thing as a free lunch. All lunches will be paid for sooner or later. If they are not, there will be no more lunches – free or otherwise. To all the above who have expressed their ongoing and increasing disgust and contempt for the rabid green blob watermelons and the equally rabid leftists in our western democracies, those posters who have problems in trying to comphrhend and understand where these green whackos are coming from in trying to destroy the very open political structures that allows them to act and talk the way they do against those same political structures and the politicals without penalties or incarceration for an indefinite period. Incarceration being the milder form of the exercise of political power against these green blob watermelon types or similar leftists radicals in most other parts of the world when they use the violent anti-national language the Green peace watermelons commonly use here and in other western democracies. A very good post on all of this by UK Labor’s Lord Donoughue can be found at Andrew Montford’s Bishop Hill blog. There is a stark difference between North and South Korea, perhaps N. Korea is the last bastion of Stalinism. However, there is a very strong message for everybody about the evils of central planning and the lack of reality of those who live in “Tinseltown” whose numbers greatly increased during the Whitlam years. Why would you espouse a renewable energy target when the costs of solar and wind are three times more than coal or gas, effectively ban the use of nuclear when the country has large reserves of Uranium, deliberately try and destroy the northern cattle trade, impose a tax on carbon when there is no significant relationship between global temperatures and levels of carbon dioxide ??? Is UNFCCC anything other than just a Funding mechanism for the failed Socialist dream globally ? OT. Tony Abbott is saying on 2GB just now that corporations earnings profits in Australia and not paying Tax on them in Australia will end, thanks to agreement reached at the G20 last week. Isn’t that just a pipe dream ? Alan Jones giving Abbott a hard time now over the secretive Free Trade Agreement with China, while selling the farm, all the farms to China. Alan Jones is asking very important questions on how this free trade agreement was reached and what are the benefits for Australians. He talks about ‘investment agreements in Tasmania’ with interesting observations on winds farms there, will this be Australia’s fire sale grudgingly accepted by an economically and spoilt population? Sorry but my thoughts and motor skills have yet to reach an agreement. Germany plans to abandon binding ? 2020 targets as well. Of course add this to Indian intentions to double coal use in 5 years and we know it’s Labor and the Greens who are conning the OZ public AGAIN. we could send the Aquasure consortium to NK. yet, here was ABC’s Gardening Australia yesterday!!! could not believe it. no mention whatsoever of what the “controversy” is about this plant. no mention it doesn’t supply water to anyone but ERIK VAN ZUILEKON for his herbs etc. who pays for all this? let me guess. the taxpayer. Blending In: Jane explores the largest green roof in the southern hemisphere, at the Victorian desalination plant. JANE EDMANSON: There’s nothing that I enjoy more than a relaxing ramble through the countryside …strolling through grasslands and nature, under a great expanse of open sky and I feel quite close to that sky right now, because I’m 20 metres above ground level and more….I’m on the top of the Victorian Desalination Plant in the Bass Coast that’s about 2 hours south-east of Melbourne. At a whopping 2.6 hectares, this rooftop garden is by far the largest in the southern hemisphere. Made up of a mixture of native shrubs, flowering herbs and grasses, this is designed to sit naturally within the landscape. JANE EDMANSON: Like a horseshoe. ERIK VAN ZUILEKON: …. that continues all the way around and it links up with the roof garden and then meanders through and joins up on the other side. JANE EDMANSON: Erik van Zuilekon is a botanist and the man behind the planting design. He is passionate about growing plants in unorthodox places. JANE EDMANSON: And they obviously depend on natural rainfall from the heavens? ERIK VAN ZUILEKON: That’s correct. We do supplement with irrigation as well during harsh periods and the entire structure was designed with the water budget in mind. Water is collected, it’s filtered through here, it’s harvested and retained in dams. We’ve got various dams around here. They have mechanisms in place which reduce evaporation and we can recycle that water through again. JANE EDMANSON: If you need to? It’s great to see a project that’s looking at the way local species react to these very challenging conditions. Rooftop gardens on a big scale are common in Europe and North America, but we’re only just starting to really achieve great green infrastructure here. I saw some bike racks the otther day !! One problem with being logical, is that you are trapped in the connection between theory, model and evidence. Having read the incredible explanations for why reduced sea ice from warming in the Arctic makes it much colder in the US and even produces increased sea ice in Antarctica, you have to wonder whether anyone cares? Any crazy explanation will do, as long it is said with authority. So without question, if the world temperature starts to go down, a 50/50 bet, we can definitely expect that the reasons will be.. coal, CO2 and Western Industrialization and consumerism. We were warned! It will be not only warming which produces cooling, but CO2 will somehow be part of an elaborate, fantastic mechanism to produce world cooling and therefore, more Climate Change and extreme events. Prof Turney had his adiabatic winds to explain his excess ice, trade winds too. Now warmed black areas of the ocean in the arctic are producing cooling elsewhere. This insane flip flop will happen overnight. Coal, obviously dirty stuff and the damnable pollutant CO2 will be the criminals once again and Barack Obama and Tim Flannery and Al Gore will be proven right. Climate Change caused by both Global Warming and Global Cooling will also produce sea rises, loss of polar bears, missing caribou and endless peer reviewed papers from the University of East Anglia. So while everyone enjoys the clear end of the Global Warming argument, the Climate Change lobby will be preparing to flip flop. Prepare for the great Global Cooling disaster and we have gone back to 1970. Use the same merchant banks to send money to the same place for carbon credits, the UN. They will forward it to the needy. The Australian Institute of Landscape Architects awarded the Victorian Desalination Project Green Roof a Landscape Architecture Award in the Research and Communication category in 2012. Still, pretty expensive market garden. Next thing they need to do is erect some glass structures and find a good supply of CO2 ! ASPECT Studios played a key role in the production of a design that contributed to the overall winning bid scheme. The Bolter lists his 5 reasons why Obama’s climate nonsense is a con. Good factual stuff. Yeah when Obama said over the weekend “The EPA has all the power it requires to ensure the targets are met” I had to laugh loudly. So basically he confirmed with a totally straight face that there will be no new requirements, provisions, laws or anything even remotely approaching concrete action, just more of the same. So if you put the announcement with China in its proper context, both leaders stood on stage to a fanfare of applause from the irrecoverably stupid and pledged to do absolutely nothing. Its better than fiction, you just couldn’t write it. A hot day in Brissy means global warming while record and near record lows in the USA don’t count. 7.10pm: Age political analyst, Michael Gordon: In the end, Tony Abbott was the one shirt-fronted at the G20 summit, not by the cunning Vladimir Putin or even the charismatic Barack Obama, but by reality. 6:40pm: For Tony Abbott, there is a dinner meeting with German Chancellor Angela Merkel tonight in Sydney. Then, tomorrow, Chinese President Xi Jinping will address Parliament in Canberra. ***6:01pm: All the questions at the Obama gathering go to US journalists. He does not take the bait when asked if he has used his “bromance” with Abbott to give his “bro” some climate change advice. 5.06pm: Abbott notes that candid conversations have been taking place and that he has some “differences” with the Russian government. 5:02pm: As Tom Allard reports, the climate change discussions at the Summit were not all peaches and sweetness. 4:52pm: The PM is asked about climate change. To what extent will you commit Australian funds to the Green Climate Fund? 4:23pm: We could not spy Putin’s signature among them. But here are a couple that did pick up the texta. ***2:23pm: Putin has called the Summit “constructive and productive” and says there has been media “hysteria”. 2:10pm: We do note that he is not alone. The Russian President has left the G20 summit and we understand, is on his way to the Hilton. International media are not allowed in. 12:54pm: Did we mention before that it was a little hot outside? It is currently 34, but feels like 36, according to the Bureau of Meteorology. just south of Brisbane, temperature hit max 37 degrees around 2.30pm and friends returned from southern Gold Coast, saying temp never went above 30 degrees. Environment Minister Greg Hunt has defended government plans to address climate change after calls by a Liberal premier for Australia to be bolder on emissions reduction targets. West Australian premier Colin Barnett came away from hearing US president Barack Obama’s speak in Brisbane at the weekend convinced it was a call to arms. “I think that we can be bolder in Australia, including in WA,” he told The West Australian newspaper. WA has significant natural gas resources. Mr Abbott has reiterated his strong support for coal-fired power in both Australia and the world. If WA has good supplies of natural gas, and can provide electicity cheaply by using it.. they should use it. NSW, Vic, Qld have plentiful supplies of coal, which supplies the cheapest cleanest energy for those states. They should continue to use that coal. There is ABSOLUTELY NO NEED for Australia to have ANY emission reduction target, nor any need for the Renewable Energy Target. Releasing sequestered carbon into the carbon cycle is a blessing and a benefit for all life on this glorious planet of ours. And of course you raise living standards by making domestic power unfordable and industrial power pricing so un-competitive that it drives industry off shore. Genius. Its great to have people like Colin Barnett on your side isn’t it, Tony must be wrapped. I think Col Pot must be chasing idiot university votes. China must be laughing their heads off. Obama promises to hurt the USA and waste billions $ for a zero return and China has to do ZIP for the next 16 years. And the idiot Shorten wants to bring in an ETS, something that even stupid Obama won’t even consider. Shorten plans to take this to the 2016 election. Abbott must be smacking his chops over this idiocy. Why would North Korea have such a drop in “solid” energy sources (coal)? As a totalitarian, centrally planned and controlled state, would not the production of coal be determined as a budget, not as a market-determined variable? Something looks “off” to me here. All you need to keep coal miners going is food and shelter. To keep power plants going, you might need to fix them, however. Could it be that we are seeing the shutdown of coal plants because they can’t buy or make the parts that are needed to keep them going? The lack of food should not be a lack of fossil fuel energy issue. Famime happens when nature does not let food grow and/or the wrong food is planted and/or there is no way to harvest it (not true when you can send millions of people into the countryside), or storage failed. Did they run out of serviceable coal? Something else is going on here. Perhaps the data on CO2 production/fuel source consumption is wrong. Then you have a famine, but energy use collapse is not part of it. I’m betting on powerplants going off-line. Have the Coal plants really gone off line. Could there possibly be any incentive off just not declaring them ? Carbon credits ? North Korea should offer Human Offset Credits (HOCs). Westerners could buy credits for North Koreans whose CO2 footprint has shrunk to zero because of famine-death. LOL.. Sometimes cartoonists just get it right !! That one went straight to my Facebook….. In a totally self-agrandising despotic tyranny? You jest. Say, I know this over at the Bolt site, but just in case our International commenters miss it, check out this article. Also well worth a read, is the first comment from Shiori_Uyoku. There’s something in all this which puzzles me no end. We, (and here I also mean ….. me, as well) can point out that this situation in Korea is exactly what a (quote) low carbon (unquote) future will look like, and people just fail to see it. I can only put it down to blind faith, and I know that makes me sound like I’m introducing the quasi religious aspect of a belief system, but surely people must be able to check things out for themselves. There is just this all pervasive thinking that you CAN just turn off those coal fired power plants, and replace them with the renewables of choice, wind and solar. If it WAS that simple an answer, then WHY haven’t they done just that. I mean, I’ve been doing this for nearly seven years now, and no one has even suggested it, let alone actually acted on it. On top of that, they just blindly allow them to actually proliferate across China etc. They introduce sanctions against Russia for its militarism against its neighbours, and yet here you have something that is supposedly going to end up being the death of us all, and no one even blinks at China, India, et al. I (we) can point out that these renewables will NEVER be able to replace coal fired power, and yet, when you say it, and then when you prove it, they still blindly believe that it can be done. I’ve grown a thick skin over these last near seven years, and all I can do now is just shake my head in wonder. And the trolls just come and abuse you. Water off a duck’s back to me now. There are elements of the green-left body politic that wants exactly this for Australia. At night, South Korea is an island. Surrounded by sea of darkness.